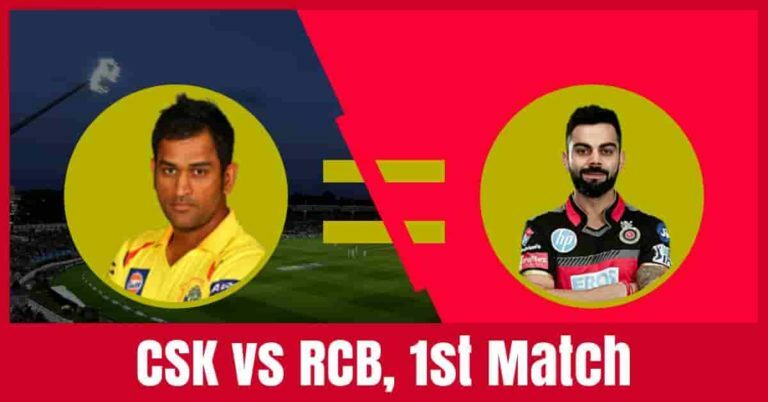 If you looking for RCB vs CSK Dream11 Fantasy Cricket Prediction, 1st Match IPL then you are at the right place. You can find all the details which can take you to the top position in any fantasy cricket leagues. We have covered pitch report of MA Chidambaram Stadium, Chennai, Players recent and past performance, the best choice for captain and vice-captain and weather report. Shane Watson, MS Dhoni, Suresh Raina, Ambati Rayudu, Faf du Plessis, Dwayne Bravo and Deepak Chahar are the key players of Chennai Super Kings Team. Lungi Ngidi has been ruled out of IPL 2019 because of injury. Shane Watson, Faf du Plessis and Suresh Raina will lead the batting department. Dwayne Bravo, Kedar Jadhav and Ravindra Jadeja will play as a key all-rounder. Deepak Chahar will lead the bowling department. MS Dhoni (c & wk), Harbhajan Singh, Suresh Raina, Mitchell Santner, Murali Vijay, Shane Watson, Ambati Rayudu, Dwayne Bravo, KM Asif, Kedar Jadhav, Dhruv Shorey, Karn Sharma, Faf du Plessis, Shardul Thakur, Ruturaj Gaikwad, N Jagadeesan, Ravindra Jadeja, Monu Kumar, David Willey, Imran Tahir, Sam Billings, Deepak Chahar, Chaitanya Bishnoi, Mohit Sharma. AB de Villiers, Yuzvendra Chahal, Virat Kohli, Shimron Hetmyer, Parthiv Patel and Umesh Yadav are the key players of Royal Challengers Bangalore Team. Marcus Stoinis and Nathan Coulter-Nile will not play as they are with the Australia team. AB de Villiers, Virat Kohli and Parthiv Patel will lead the batting department. Moeen Ali will play as a key all-rounder. Mohammad Siraj, Tim Southee and Shivam Dube will lead the bowling department. Virat Kohli (c), Heinrich Klaasen, Kulwant Khejroliya, Parthiv Patel (wk), Prayas Barman, AB de Villiers, Moeen Ali, Mohammed Siraj, Shimron Hetmyer, Akshdeep Nath, Devdutt Padikkal, Shivam Dube, Himmat Singh, Umesh Yadav, Milind Kumar, Navdeep Saini, Gurkeerat Singh Mann, Washington Sundar, Colin de Grandhomme, Tim Southee, Marcus Stoinis, Yuzvendra Chahal, Pawan Negi, Nathan Coulter-Nile. The pitch of MA Chidambaram Stadium is good for batting in the initial couple of overs but the wicket generally favours the spinners as the match progresses. Overall the spinners may take advantage of the wicket today. Dream11 Fantasy Cricket Tips: Try to take top order batsmen and spinners in your teams. The weather of Chennai is forecasted to be mostly sunny and it will remain the same throughout the day. The sky will be clear and there is no sign of rain today. The temperature is expected to be 30-Degree Celsius and the Humidity to be 70%, which may go up to 86%. Dream11 Fantasy Cricket Tips: The weather may favour the spinners. This is it for Today’s RCB vs CSK Dream11 Fantasy Cricket Prediction 1st Match. What is your best team? Leave a reply in the comment section.